Up until now, we have only heard rumors and seen still pictures of what Ubuntu running on an Android device will look like. Today however, a video has surfaced of the service up and running and it is exciting to see. It was promised that Ubuntu for Android “transforms your high-end phone into your productive desktop, whenever you need it.” While you might be skeptical at that claim, after watching the video your opinion might change. Unfortunately, the video is in Portugese because this was being shown at a tech conference in Brazil, but you do get a good idea of how the system works just by watching. Plugging the phone into the dock launches the Ubuntu system, which runs parallel to Android. It is not emulated by any means and gets to use all the power your phone has to offer. This means that system features like notifications can be swapped between Ubuntu and Android seamlessly. It makes Motorola’s Webtop system look silly. Unfortunately, the caveat of this new development is that Ubuntu needs access to each phone’s drivers which means that OEMs like Samsung, Motorola and HTC would have to be interested in this to get it running at the speed that it should. 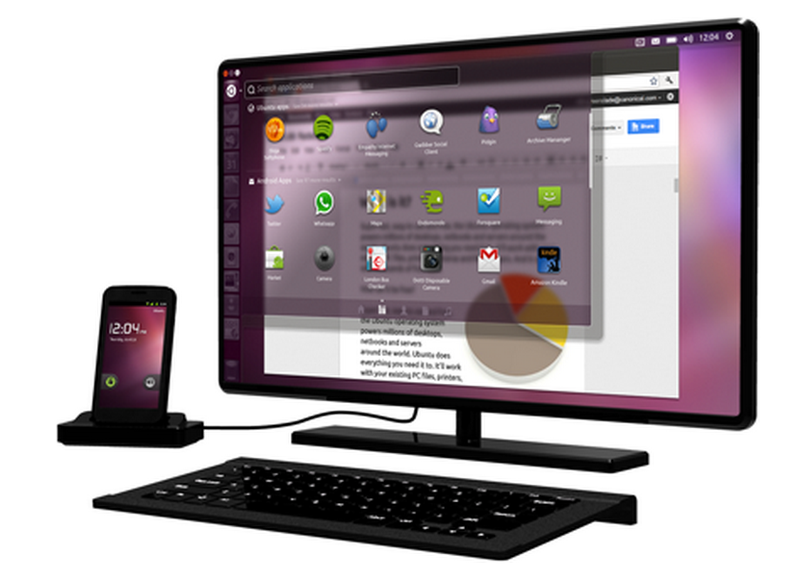 Once that happens though, Ubuntu will give a new meaning to the Android phone dock. Does this excite you? Would you use your phone as a desktop if it ran this smoothly?